The views around the Rockport harbour are endlessly fascinating for me. What makes the scene so unique is that the harbour is walled in on all four sides, except for a small passage at one end where the boats go in and out. That means that it can be painted from all sides as well. I had hoped to paint all four views this week but ran out of time. 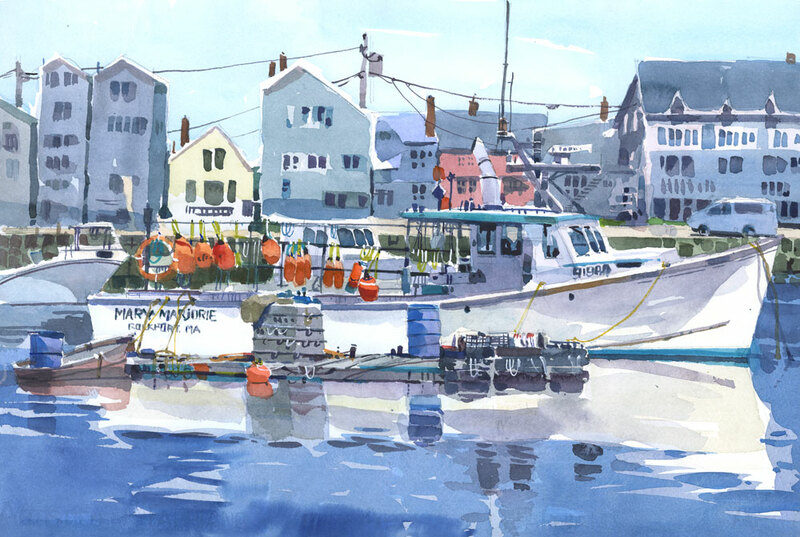 I’ve already posted my first painting of the harbour, with the fishing boats and the parking lot in the distance, but added the scanned version here because it features the lobster boat Mary Marjorie in the back, on the left. Much to my frustration, this boat went out to sea before I had a chance to paint it, although my drawing of it was fairly detailed. Colour was added from memory, which is not that hard to do with a white boat and bright orange buoys. I had a second opportunity to paint the Mary Marjorie a few days later from the other side of the harbour. This time it stayed in the same spot while I painted, allowing me to add in all the details on the dock and on the boat itself. It’s always difficult to know when to stop without overworking a painting. 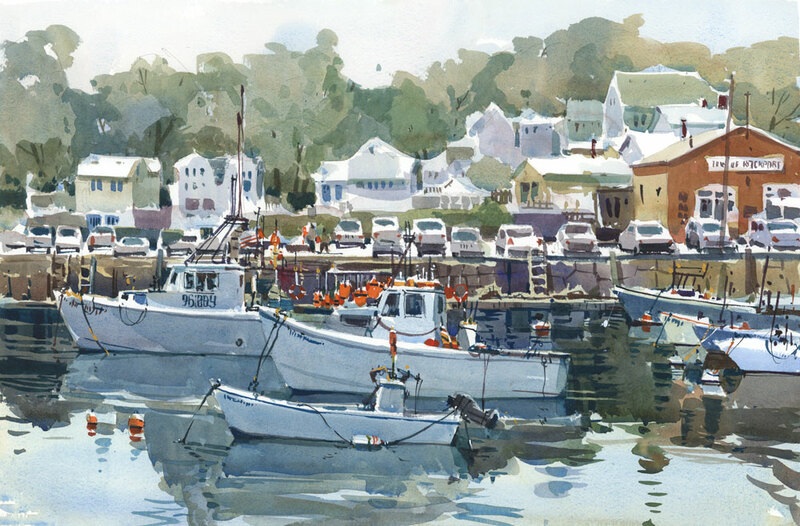 I couldn’t step back to evaluate the painting from a distance because my easel was wedged between the edge of the dock and a parked truck, but near the end of my painting time another painter walked by (there are so many painters in Cape Ann!) and we chatted for a while. She took a look and told me I was done — she was pretty sure that if I continued to paint, I would overwork the painting. That was good advice. When I got home I realized that it was pretty much finished, except for a few strokes here and there to tie things together. Much appreciated, Nellie! Both versions of the harbour are 22″ x 15″. There’s the word I was lookin’ for – stunning! Ah Soni, thanks so much! You always blow my mind. I feel like one of the voices on the Voice. I am at a loss for compliments. Lisa, I didn’t realize you knew this place well… maybe you already told me but I forgot. Thanks! I don’t know what else to say! These are just beautiful!!! How long does it take you to paint one of these scenes? You manage to get so many details without it looking “picky”. These half sheets take between two and three hours. I would say closer to 2.5 hrs. Sometimes I add a few details back home after I have stared at it for a long time. I don’t like working on the details for too long so I try to stop myself, or I listen to someone else telling me to stop! As all before me have said, each of the paintings is wonderfully done. 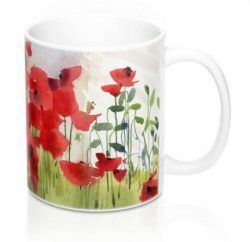 Each has something special and unique for the viewer to enjoy. I love the row of cars lined up in the parking lot knowing the drivers are enjoying the view, the day and maybe time spent on board a boat of their own. I also like the cluster of buildings in front of tall foliage. The second painting shows us such a clear day with a blue that is exquisite. I am so drawn to the freshness…blue is my favorite of all favorites. Bernadette, thanks so much for writing. You can see why I love this place. The complexity of the scene is what I like best. It is so unlike anything we see here in Montreal. I really enjoy your larger format paintings. They are so lovely! And the reflection of the boat in the second version of the Mary Marjorie is a whole lesson on reserving whites. 🙂 I really hope you do a “Boats and Water” class at some point, online or in real life, or even better both. How great that the harbor is designed so that you can get so many views. This is lovely with the pops of color amid the blues. Wonderful as usual…..water looks so good with the reflections…. When you are painting outdoors on 15×22, how long are you painting? I’m sure your sketching is very quick. And I’m sure the light keeps changing. You are really in control of any situation!! Hi Donna. For a half sheet like this it takes over two hours to complete. Under three hours for sure. Yes, the lighting does change but I try to record the cast shadows all at once so it makes sense. Hi Soni. These take somewhere between two and three hours. And then a few minutes once I get home to work on the details once it is completely dry. Beautiful! What kind of easel do you use? I have been using it for years and I am very happy with it. My computer has been ill and refused e-mail–in or out. So I have fallen behind. I got it back a few hours ago and have been trying to catch up, afraid I had missed your posts. But I think I am caught up. I love boats. Paintings of boats-yours are so wonderful. Don’t want to repeat what has already been said but ditto to all. Your water reflections are so fresh. I will have to work on that so as not to overdo. Due to your paintings, I have decided to start planning our fall trip to Maine.